...let's put that on the list of top 10 things not to ask a new mom. I remember many times when random strangers would stop to coo over my newborn baby, asking "is he letting you sleep?" Or "is he a good sleeper?" First of all, I don't know why we feel the need to tell complete strangers how well our child is sleeping. Second of all- there's a good chance that my newborn is not sleeping through the night, and an even bigger chance that I'm beyond exhausted from staying up with him. I would smile sweetly and say "not yet" or lie and say he was a "good" sleeper. What I really wanted to say was "mind your own business and move along, lady"
I would get it from family too. "MY children were sleeping through the night by 4 months"
"Don't worry, by 6 months, he will be on a good sleep schedule." Let's fast forward to present time. I'm currently acting as the end piece of bread in a Mason sandwich at 1am because we gave up and let our screaming 15 month old sleep in bed with us. He has NEVER consistently slept through the night. We usually only let him sleep in our bed in the morning when I want a few extra hours of sleep, but it's summer now and his room is hot- ours is air conditioned. He tosses and turns in his crib all night, and sometimes it's easier just to give in and bring him into our room. It beats dragging myself out of bed 2-4 times a night to calm him down- especially when we both work in the morning. People don't ask me if he's a "good" sleeper anymore. I know it's because of his age- it's just assumed that he's sleeping through the night. Can you tell that I hate the term "good sleeper"? A child who sleeps through the night is no better than one who doesn't. Also, don't you love when moms gush about their 5 day old good sleeper on Facebook like they just won the Nobel Peace Prize for sleeping through the night? That's not what I want to read after I've been up all night crying as much as my baby, begging God to let him sleep for just a few hours so I can shut my eyes, and feeling more emotionally depleted and utterly exhausted than ever before in my life. No lie, I actually heard someone refer to her newborn daughter as "a good girl" because she slept well. 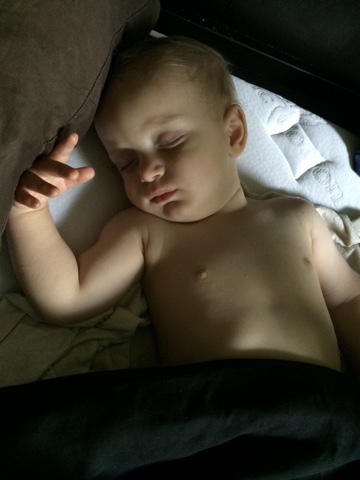 So is my son a "bad boy" for not sleeping well? ALL babies are good babies. If you're a new mom reading this, wondering if you'll ever sleep again, I honestly can't answer that yet. Just know that you aren't alone, and at the end of our very long days, it's all worth it.